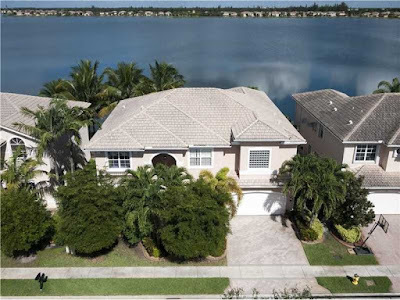 Broward Real Estate: Sunset Lakefront Home On The Market! Sunset Lakefront Home On The Market! This is a superior waterfront residence in Sunset Falls located in Miramar. This is the largest model home in the whole entire development! This gem sits majestically in front of a gorgeous lake. The seven bedroom and five bathroom home is laid out generously over almost four thousand and seven hundred feet of perfectly appointed living space. The over sized gourmet chef's eat in kitchen is equipped with a full suite of stainless steel appliances, custom high end wooden cabinetry, sleek granite counter tops, and a walk in pantry. The gorgeous architectural details feature hand crafted wood and iron banister, crown molding, covered lanai, breezy balcony, and spectacular views from the master suite. The backyard oasis borders the shimmering lake and has a meticulously tropical landscaped mature fruit trees and foliage. This house has a rare sense of privacy with the mature landscaping. 17579 South West 54 Street located in Miramar and is currently asking $625,000.00. Residents of Sunset Falls have plenty of amenities to enjoy. There is a state of the art fitness center. A sparkling community pool overlooking the lake. The neighborhood is gated and has a manned entry. The tennis courts are a perfect way to showcase your competitive edge. This is in a great school district! Waterfront Estate For Sale In Fort Lauderdale!